From cows in the meadow to most successful anti-clotting agent of all time seems a big leap, but new medicines are discovered in all sorts of quirky ways. So step back to 1921, when ranchers were dismayed to see their cattle, whose diet seemed no different than in previous years, start bleeding to death. It was a rainy season, which was bad enough, and now their cattle herds were decimated. Any small cut led to an outpouring of blood. The roughage the cows ate cut their innards--and the internal bleeding led to death. In Saskatchewan that year, one man lost 20 of 21 dehorned cattle to this new bleeding disease (see Dowse "Dabigitran: A New Antithrombotic Agent for Stroke Prevention," 2011). No one had seen anything like it, and there seemed no reason for it. An exhaustive comparative study between fields where the animals were dying and those with healthy cattle revealed that the cows that died had been eating a certain spoiled sweet clover. Karl Paul Link, a researcher funded by the Wisconsin Alumni Research Fund (WARF), set out to find the compound in the clover that led to such unstoppable bleeding. Link discovered coumarin, and he named his isolation of it warfarin, after his supporting body--warf and the ending arin of the substance. This warfarin acted as a major anticoagulant, but, interestingly enough, unspoiled sweet clover didn't produce it. The heavy rains had caused the spoilage that activated the compound--and wreaked such havoc. Quickly named the Sweet Clover Disease, the cattle day was saved when farmers simply prevented their cows from eating the spoiled sweet clover. Warfarin was a fantastic discovery for farmers and ranchers--but seemed to have reached the end of its usefulness. In fact, the history of the compound might have wound up as an asterisk in science and veterinary texts had Professor Link not developed tuberculosis, and had to cool his heels in a sanitarium. It was there that he read about the rat control problem that was occurring even on some of the very same farms that had suffered the cattle losses. And, in the way that great minds can connect disparate threads, he came up with using warfarin as a rat poison. 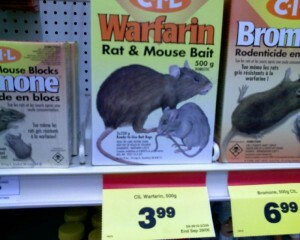 As uncomfortable as this may be for those on Coumadin, warfarin is still today used as a—very effective--rat poison. But of course the story doesn't end there either, as millions of people well know. Introduced as rat poison in 1948, warfarin was obviously considered dangerous for humans. A fortuitous failed suicide attempt changed that, and opened the doorway for warfarin's entrance onto the stage of human affairs. It was only when a farm worker tried to kill himself by eating the rat poison--and didn't die--that the drug's true possibilities became clear. The worker was taken to the hospital, where doctors successfully gave him vitamin K to counteract the warfarin, and with the knowledge of how to counteract an overdose, the to-be-medicine was suddenly ready for the human market. In 1952 it was first used as a blood-thinning agent. The FDA approved warfarin in 1955, and it gained true fame and fortune that year when doctors used it to treat President Dwight Eisenhower after his 1955 heart attack, to great success. 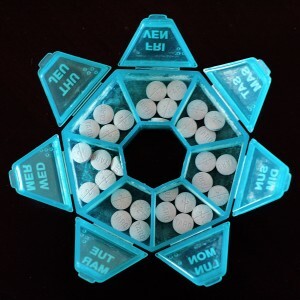 It is most commonly sold under the brand name Coumadin (lesser known brand names are Jantoven and Marfarin), so named by DuPont Pharmaceuticals Company, its original maker, but is readily available in generic form. In 2001, Bristol-Myers Squibb bought out DuPont, adding Coumadin to its portfolio. Still used to treat and prevent blood clots, Coumadin is the twentieth most prescribed drug in the U.S., with more than 20 million prescriptions written for it each year. It’s come a long way from rotting in the cow pastures.